Posted February 6, 2014, in Student Alumni. 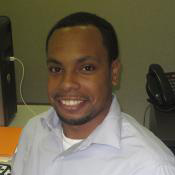 Joseph Harris earned a BA with honors in Economics, with a minor in Finance from Rutgers University–Camden. Joseph is pursuing a Master in Public Administration with a concentration in Public Management at Rutgers University–Camden. Prior working for the Walter Rand Institute, he worked as a research assistant for the Economics Department focusing on topics related to Health Economics. Joseph was an intern for the Supervision, Regulation, and Credit Department of the Federal Reserve Bank of Philadelphia, where he conducted economic research for the Partnership for Progress, a Federal Reserve System program to help promote and preserve minority-owned depository institutions. He also volunteers assisting the Woodbury Economic Restructuring Committee, an economic community development program that supports local businesses located in Woodbury, New Jersey. Page last updated by Senator Walter Rand Institute for Public Affairs at 12:44 pm August 2, 2016 . This page was printed from http://rand.camden.rutgers.edu/2014/02/06/harris-joseph/ at 4:29 PM Monday, April 22, 2019.